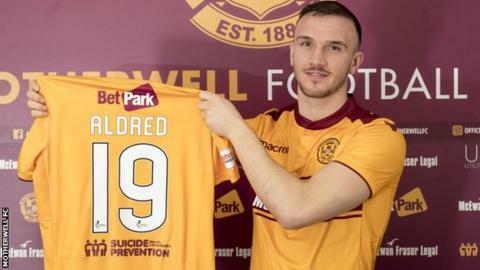 Motherwell have signed defender Tom Aldred on loan from Bury for the remainder of the season. The 27-year-old moved to Gigg Lane over the summer and has made 23 appearances for League One's bottom side. He has previous top flight experience in Scotland from a brief loan at Inverness Caley Thistle in 2011. "I am really looking forward to it, to getting my head down, working hard and being the best I can be," Aldred told the club website. The defender started his career with Carlisle United before a move to Watford in 2010 but did not nail down a regular place until joining Accrington in League Two in January 2013. He then spent three seasons with Blackpool, captaining them to League Two play-off final success last season. "We were clear from the start of the January window we were looking to increase our options in central defence." said 'Well manager Stephen Robinson. "Tom ticks that box and arrives at the club with plenty experience under his belt. "We tried to get him in the summer, so we are delighted to finally have him at Motherwell."